After the area had been depopulated after the Ottoman Rule, first settlers came to the region in 1768. Many of them answered to a call by Prince Anton Grassalkovich II. Most of these first settlers came from surrounding Swabian villages, a smaller part from Hungarian and Slovakian villages. The number of the German population grew steadily over the years and thus Vecsés came to be known as a “German village”. The settlement had its own priest by 1797 and a German speaking Catholic school. 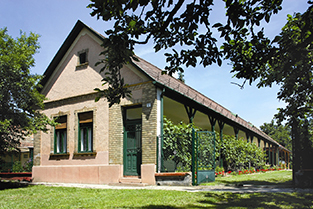 After the railway was built in 1847, more and more people came to inhabit Vecsés in the second half of the 19th century. The German part of the village has maintained its atmosphere and the German population was a closeknit community up until their displacement. Due to its proximity to the capital, the farmers of Vecsés acquired some wealth by selling their products. They specialised in vegetables, especially cabbage Around 1920, approximately 400 carriages loaded with fresh vegetables, milk and other products left the village for the markets of Budapest each day at dawn. In the beginning, the cabbage was sliced manually, leavened in wooden barrels and later pressed under enormous stones. Even after the Agricultural Production Cooperatives had been established in the 1960, the leavening of cabbage continued and the families continued to work on their private fields of one jugerum (0.25ha). For a long time now sauerkraut has been the most famous product of Vecsés’ farmers and still earns a livelihood for many people today. In January 1945 the prosecution of Germans began. 327 citizens from Vecsés were deported to the Sovjet Union as forced labourers. In 1946, approx. 1.500 persons were displaced from their home village and resettled in Germany. In their place, agricultural proletarians from the lowlands and from Czechoslovakia as well as displaced Hungarians populated the village. Only after 1990 it became possible to revitalise the German customs. The heritage and traditions of the German inhabitants can be seen in the brass band, the production of sauerkraut and the Corpus Christi procession. On the Feast of Corpus Christi, four altars are built alongside the procession’s way and are decorated with carpets made of flowers. Twenty years ago, a partnership between Rheinstetten and Vecsés was established. The local history museum was opened on the 65th anniversary of the displacement of Germans and allows a glimpse into the living environment and traditions of Germans around 1930. 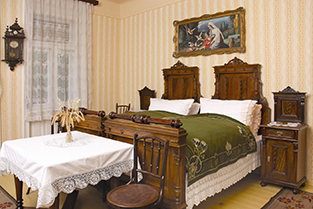 The museum is located in a house that was built around 1930 by Johann Berger and his wife. The Berger family had been displaced in 1946 and later owners had maintained the impressive building in its original condition. opening hours: upon previous notice. The exhibition commemorates the gentrified agricultural world. The wealthy farmers had – according to the fashion of the time – built a new farmstead of bricks. Only the back of the old agricultural building was kept, as the pisé-style wall in the chamber shows. 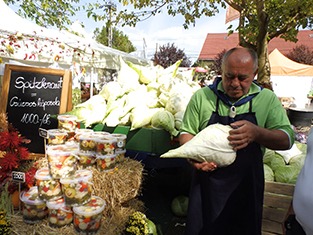 Vecsés is famous for its cabbage in the whole of Hungary . The Cifra Csárda is one of the oldes buildings in Vecsés. 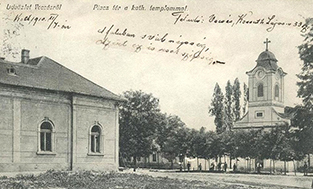 On the opposite side of the road lies the church which was built in 1800 and destroyed in World War II. Parlour in the local history museum. 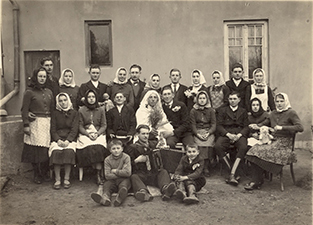 The local history museum shows the life and traditions of German residents around 1930. 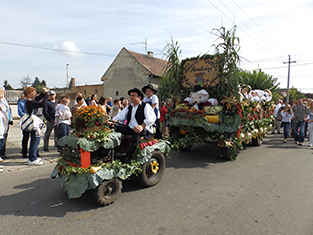 The first Cabbage Festival was held on September 30th 2001 when Vecsés reached city status. 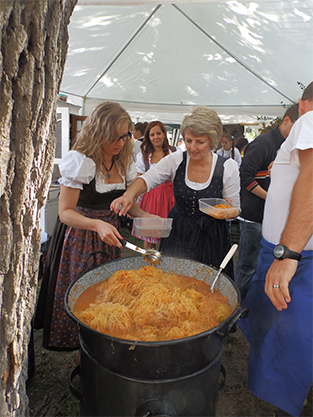 The program me consisted of cabbage cooking competitions and a sauerkraut competition, which had become the main event of the Festival today. The second Cabbage Festival already hosted a “cabbage conference” and the third time, the Festival went international with guests from Austria, Germany, Poland, France and Peru. The Festival is held annually in September. The day starts with a traditional harvest festival mass and the blessing of the harvest in church. Afterwards, a procession of cabbage producers leads the visitors to the rich cultural programme with product booths and exhibitions. Dir sei Dank zu jeder Zeit. Thank God for ever more. In which our seeds glow. Give our sowing rich a bloom. Strudel dinner was a popular custom in Vecsés until the 1950s. After several days of celebrating carnival, everyone had a strudel dinner on Ash Wednesday. The young men went – accompanied by musicians – to each house in which a girl lived. Similar to a wedding procession, one man was dressed as the bride, one as the groom. Upon arrival, the group was given a fresh strudel meal. They tasted the strudel and took the girl with them. After the procession, all of them went into a tavern and ended carnival with a dance. Since 2003, the German self-administration commemorate the custom. The kindergarden and school children stage a programme with scenes that are connected to the strudel tradition, the music and the local dance from Vecsés. And of course – many different traditional strudels are baked and the day is ended with the brass band and a ball. 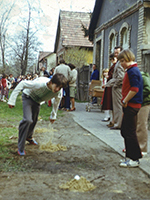 A rare and old tradition which is still cultivated in Vecsés is the egg-on-spoon race. The race is held on Easter Monday in Új utca, nowadays Jókai Mór Street. The event is accompanied by the brass band.